Chairman Larry Tomlin makes a point during the Albany Planning Commission’s meeting Monday. It took only a few minutes Monday for the Albany Planning Commission to turn down a North Albany rezoning request that had drawn opposition from scores of nearby residents and property owners. The commission voted unanimously to deny a change from medium-density (RM) to mixed-use commercial (MUC) on 12.7 acres north of Hickory Street. The property is off the end of Pleasant View Way and lies adjacent to houses that front on Troon Street in the North Pointe subdivision. The change was requested by Jim Winkler of Portland and his development company. It would have allowed higher-density housing and slightly higher buildings than the existing zone. The planning commission heard opposition to the change at a public hearing on March 6. Then it kept the record open, and this brought an avalanche of letters and petitions from opponents. The city planning staff had recommended approval of the change because it met various goals of the comprehensive plan. But the commissioners on Monday saw no compelling reason for the rezoning in view of the intense opposition. They noted that even without the change, the developer can build the main thing he said he wants: housing for seniors and working people who rely on public transit. The present zoning of the vacant land allows up to about 300 apartments, which the city has said would yield up to 192 car trips during peak hours. Opponents of the zone change said they were worried about more traffic and other effects on nearby residential areas. 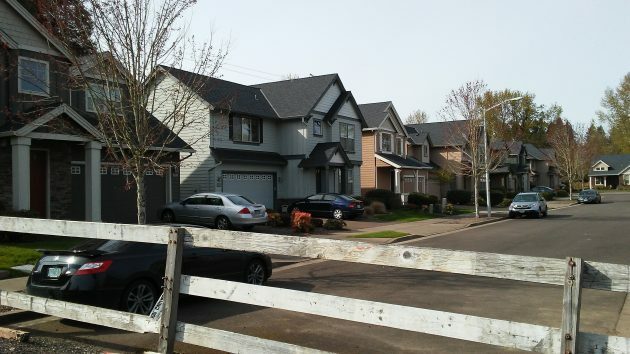 The land at issue in the Winkler zoning request lies on the other side of these houses on Troon Street in North Albany. The Planning Commission finally demonstrates some spine, telling a property developer to take what it can get and no more. Of course, when the same kinds of issues were raised by the imminent construction of the Walmart, the Planning Commission couldn’t kiss enough butts fast enough to accommodate the beast from Arkansas. It seems they’ll bend over when the opposition is of a certain weight class. Sad! Now wait just a minute! For once it looked like the North Albanians would get to share the load of dense housing/populations that we flat landers have had to for years. The work force complex on Salem Ave took little consideration about traffic & schools. Same with the mega complex at Queen – Oak & Hill – 34th. We’ve just had to “live” with it. Share & share alike there.